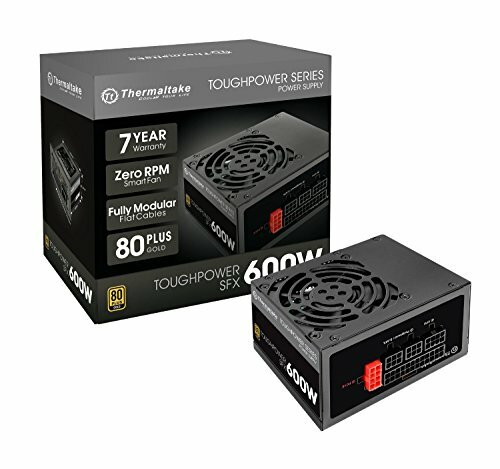 Powerful performance, small footprint, the Thermaltake Tough power SFX 600W 80Plus gold power supply is here. With options for both SFX and ATX form factor mounting (ATX bracket included), the SFX 600W delivers High efficiency for users looking to gain proper power for micro chassis or slim line applications. Save even more space with a fully modular cables to free up precious space. Built-in zero RPM Smart fan system automatically controls fan speeds allowing zero RPM options for users looking for a total silent system. Take back your space with the Thermaltake SFX power Series for a universal compact design, 100% High quality Japanese capacitors and dedicated 12V+ rail design for the right fit on your next build.